Birthday Wish – Mobile Marketing Made Easy! Select Target List: Here you will select the opt-in list you would like to use. 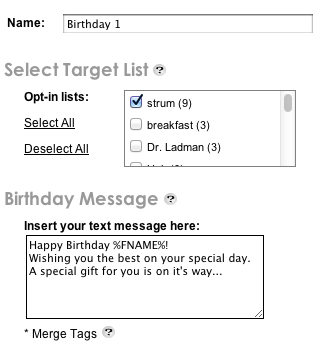 By selecting an opt- in list, this allows you to send out birthday wishes automatically. You must update the date of birth in your opt-in database. Clicking “select all” allows you to select all of the opt-in lists. Birthday Message: Under Insert your text message here, customize your birthday message that you want your clients to receive. You can send the message on a persons’ birthday or prior to it. Click the drop down box that says “Day of” to choose when you want your birthday wish to be sent. Choose 1 day, 2 days, up to a week, 2 weeks, a month etc. Also select the time you wish to for your customer to receive the birthday wish with the scroll box at the end. Check the box next to “Notify me” so you receive a notification when a wish is sent to your customer. 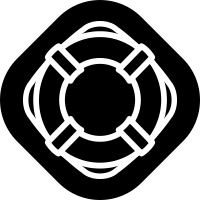 Get notified either by email or text message, all which you input.